Welcome to the free NAYS Concussion Training program. This program is designed to provide you with valuable information on concussions and add to what coaches, parents and administrators should know regarding concussion safety. Concussion awareness and prevention is an important issue in youth sports today as it affects the health and well-being of children participating in all sports, and at all levels. When it's safe to allow a player who has suffered a concussion to return to play; and the steps to recovery. 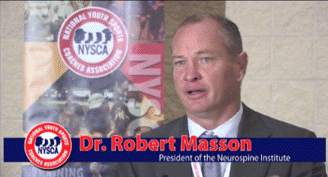 Education for athletes to help prevent concussions. Throughout the training you’ll find multiple choice questions to test how well you understand the material. Once you correctly answer all of the questions you can print out a certificate recognizing that you have completed the concussion training. After completing this training if you are interested in further information regarding concussions, visit the additional resources link to find handy printouts, related articles and supplementary concussion websites such as STOP Sports Injuries and the Centers for Disease Control and Prevention's Head's Up: Concussion in Youth Sports. The National Alliance for Youth Sports applauds you for taking the time to complete this NAYS concussion training to help protect the players on the field. With that in mind, let's begin.